Malabar Spinach (Basella alba) is a widely-used fast-growing edible perennial vine native to Southeast Asia and India. It's vitamin-rich leaf is thick and succulent. 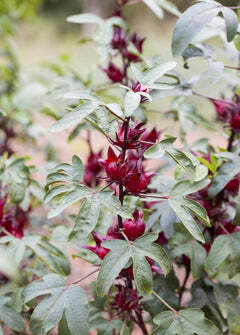 The stem is vibrant red in color and the leaves are green with splashes of red. Malabar Spinach is heat loving, drought tolerant, and does well in sandy soil. It's a great summer alternative to spinach or other leafy greens. Malabar Spinach is an essential summer plant in the Sow Exotic permaculture garden. We have it planted under fruit trees and along fence lines for a beautiful, tropical, ornamental look. Plant Type: Perennial Herb, Vine. Malabar Spinach can also be grown as an Annual in temperate climates as a heat-loving alternative to Spinach.